The communication current reality tree is a clever combination of the necessity-based logic of the cloud converted to sufficiency-based logic and then combined with the sufficiency-based logic of the current reality tree to describe the relationship between observed undesirable effects (symptoms) and the underlying core conflict. (1) Current realty tree – shows the core problem as the source of many undesirable effects. (2) Cloud – shows the core problem is not the product of any one person. You will often see communication current reality trees used in Theory of Constraint applications to show the dynamics of the existing situation. It is, after all, a communication device. The cloud and current reality tree are each, of themselves, an analytical device, but the combination doesn’t seek to analyze, it seeks to inform. How do we construct one? Well let’s have a look at that. You will also find a good summary in Scheinkopf (1). Let’s start with a cloud. As we have seen previously in the section on clouds this tree is based on necessity-based logic and is read as follows; in order to have the objective we must have requirement A, and in order to have requirement A we must have prerequisite A. 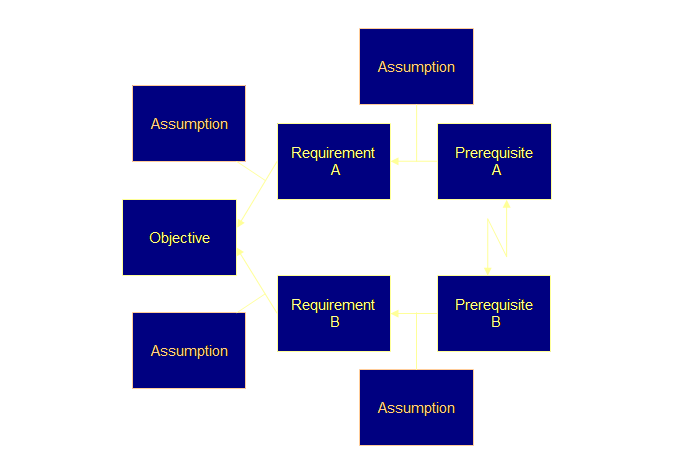 On the other hand in order to have the objective we must have requirement B, and in order to have requirement B we must have prerequisite B. 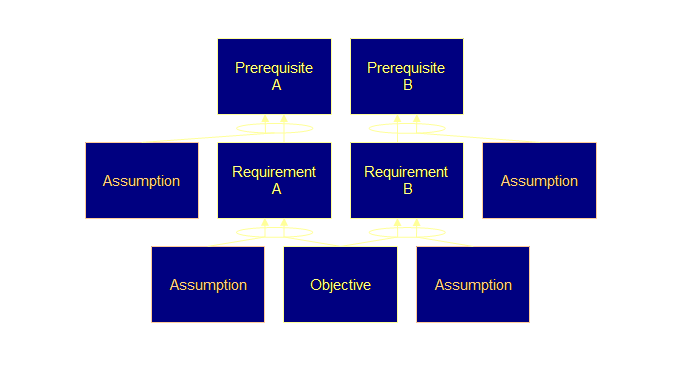 However prerequisite A and prerequisite B are in conflict with each other. We know also that underlying each of the arrows are some unverbalized assumptions. Let’s draw these in also. So now we have a cloud converted to sufficiency logic. What we do next depends upon how we reached this stage. If there is an already assembled current reality tree, then it needs to be tied back with cause and effect to the prerequisites. 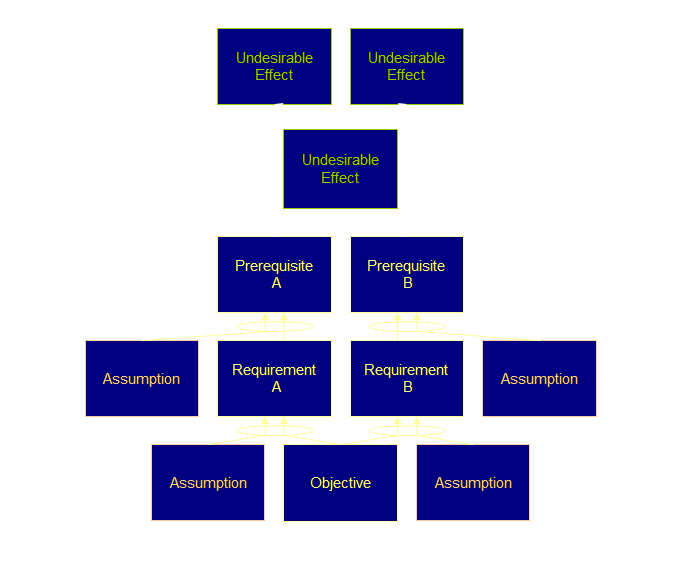 If you are using the 3 cloud method, then we will develop the communication current reality tree directly out of the prerequisites using the undesirable effects that we listed in constructing the specific clouds (see below). Let’s give some indication of what this might look like. So there we have it. A communication current reality tree. A tree that ties the undesirable effects back to the core conflict – the rock and the hard place, demonstrating that the core problem is not the deed of any one person. The three cloud method is, I believe, a Socratic tool which serves the purpose of both determining the core conflict and building consensus amongst members of a group who may have little intuition for the situation of other members in the group. It doesn’t’ replace the rigor of the current realty tree in determining the core conflict. If you look carefully at the Theory of Constraint examples you will see the current reality tree is still being used whenever people are analyzing a problem on their own, before showing it to someone else for comment. In my experience, however, the current reality tree is still perfectly usable with large groups of people from within the same functional group or area, especially if the group discipline is maintained with a few simple rules and procedures such as variations on the Crawford Slip Method (2, 3). However, where the 3 cloud method comes into its own is cross-functional groups. Properly facilitated the 3 cloud method will negate the 5th layer of resistance at the early stages of analysis. We might think of it as a strategic tool then rather than as an operational tool. A generic cloud of the problem is constructed from at least 3 individual and specific clouds that address the general problem – either single clouds from different individuals or multiple clouds addressing different aspects from one individual. The underlying assumption is that a deeper generic conflict gives rise to each of these specific clouds. The generic cloud is constructed by summarizing each of the entities in each of the specific clouds into one common entity. The generic cloud can then in fact be used in a communication current reality tree to build out to all the undesirable effects. Brief descriptions can be found in; Lepore and Cohen, and also Smith (4, 5). Breaking the cloud with a generic injection sets the direction of the solution and the injection can be used to develop the future reality tree. Constructing a future reality tree will give rise to negative branch reservations and obstacles which must be dealt with. The process is very effective, however, needs to be properly facilitated to be truly successful. Be aware that it exists, but leave it until you have confidence with the communication current reality tree. (1) Scheinkopf, L., (1999) Thinking for a change: putting the TOC thinking processes to use. St Lucie Press/APICS series on constraint management, pp 235-241. (2) Dettmer, H. W., (2003) Strategic navigation: a systems approach to business strategy. ASQ Quality Press, pp 91-93 & 215-228. (3) Dettmer, H. W., (2003) Brainpower networking using the Crawford Slip method. Trafford Publishing, Inc., 181 pp. (4) Lepore, D., and Cohen, O., (1999) Deming and Goldratt: the theory of constraints and the system of profound knowledge. The North River Press, pp 121-133. (5) Smith, C., In: Smith, D., (2000) The measurement nightmare: how the theory of constraints can resolve conflicting strategies, policies, and measures. St Lucie Press/APICS series on constraint management, pp 143-152.